Today’s Gospel begins with Jesus coming down from the mountain with his disciples, he is there in the midst of them. Jesus not only talked about working with others, but he works as part of the team of disciples delivering a message which the people flocked to hear. Maybe they also came hoping to be healed and somehow have a better life for themselves because of what they heard. Jesus today teaches us the attitudes we should have towards other people and all elements of our lives. 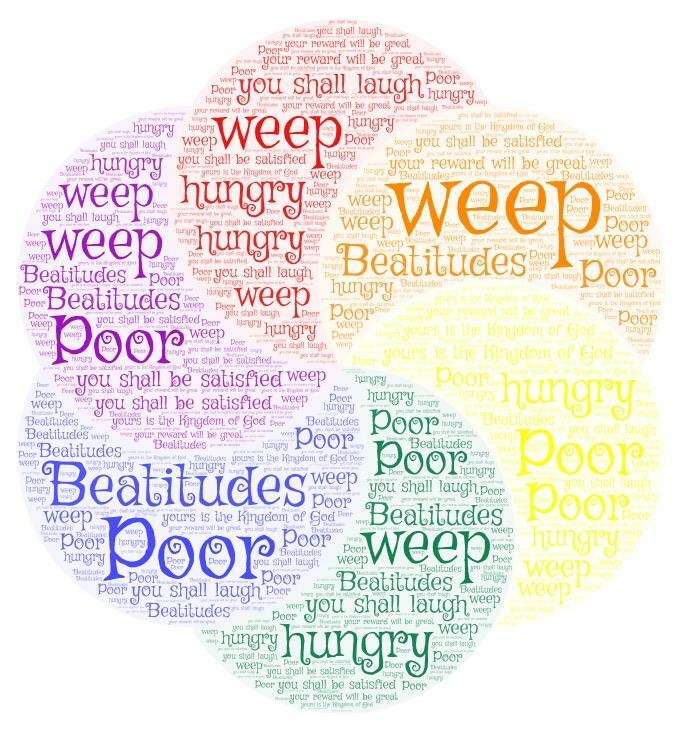 At first this reading can appear as if being poor, hungry, persecuted or weeping is a blessing. 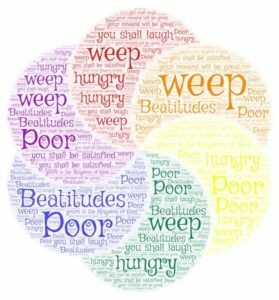 Jesus does not wish us all to be living our lives in sorrow or in need. He is not asking us to go around with a long face or go looking for hardship of any sort. Rather, Jesus is challenging us to view our world through the lens of the Kingdom of God, not to glorify values in our world which are not part of the kingdom of God. In the kingdom of God, power or material possessions are not the important values; trusting in God is. People who only value the luxuries of this world will find it hard to play a part of the Kingdom of God. • How are people poor in our world, not just in the economic sense? • How can we be hungry and still have food to eat? • How would our lives be without God? This reading calls us to simplify our lives and change our notion of what society values. In our world, very often it is the rich who get richer and the poor who get poorer. In the Kingdom of God this is completely turned on its head. The challenge of the Kingdom of God is to trust completely in a loving God who values each of us equally. • In what way can I live out the Kingdom of love and justice in my life today?